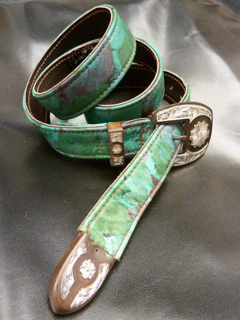 This one-of-a-kind-belt is made from a floral print leather. It is our wrapped-edge style belt that is made with 3 pieces of leather, an interior, a top wrapped piece and a cut leather lining on the back, so it is sturdy. The Ranger Buckle Set (meaning it has a buckle, keeper and tip that match) is silver colored metal that is etched on top of a dark coppery brown background metal in a western style. The size is 35-39" and can be made smaller. This is an Off the Rack piece and is Available Now.